Upstate returns to The Station!! Recorded primarily over six days at the Clubhouse studio in Rhinebeck, NY, ‘Healing’ is the band’s first release with new member Allison Olender, their first with four contributing songwriters, and their first since shortening their name from Upstate Rubdown. It’s also their first project to be produced by Wood Brothers percussionist Jano Rix, who helped the group embrace their transformation and lean in to their unique lineup without sacrificing any of the gorgeous harmonies, eclectic arrangements, and unforgettable performances that have defined the band since their earliest days. 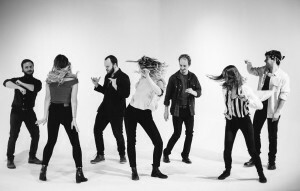 Upstate first emerged from New York’s Hudson Valley in 2015 with their critically acclaimed debut, ‘A Remedy.’ The Poughkeepsie Journal raved that the group “need[s] nothing more than their voices to channel rhythm and stoke your emotions,” while Chronogram hailed their “infectiously sunny organic stew,” and The Alt called them “toe-tapping, contagious, and fun.” The album earned the band festival performances from Mountain Jam to FreshGrass, as well as a slew of national headline dates and support slots with everyone from The Felice Brothers and Phox to Marco Benevento and Cory Henry.